it has nevertheless exerted enormous influence by clarifying areas of obscurity, reconciling seemingly conflicting evidence, unifying to a remarkable degree events occurring in distant parts of the globe, establishing new pathways toward knowledge, and opening the door to new subjects of investigation, all the while raising a myriad of new and important issues. 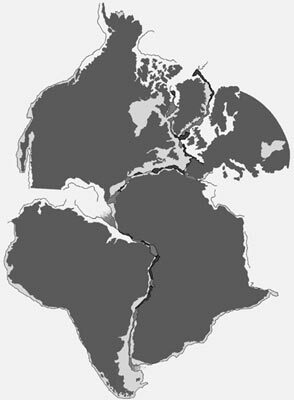 Wegener's theory holds that the world originally contained one supercontinent, Pangaea, that broke into two major landmasses: Laurasia and Gondwanaland. Over millions of years these continents fragmented and drifted away from each other. Traditionally, continents were thought to rise and sink, but plate tectonics goes much further. It proposes a lithosphere, or rigid outer shell formed of the crust and upper mantle, which is divided into a small number of plates that float on and travel independently over the more fluid portion of the earth's mantle. These plates form the continents and ocean floors. Much of the earth's seismic activity and volcanism, along with mountain-building processes and submergence, occur at the boundaries of these plates. Many reconstructions have been attempted . . . but none are entirely acceptable. *Also retrievable from http://ourworld.compuserve.com/homepages/dp5/tecto.htm; this article clearly summarizes much of the scientific data inconsistent with, or not explained satisfactorily by, plate tectonics. Other difficulties with these reconstructions include the ways in which the geologic strata of some of the continents come together at odd angles instead of blending together seamlessly. Though it is the dominant view today, not all scientists subscribe to plate tectonics. An increasing number of geologists who are looking for a crack in this rigid crust of thinking discuss their findings in forums such as the newsletter New Concepts in Global Tectonics. Here geologist Shantanu Keshav of the Department of Earth Sciences, Bombay, India, asserts that "Plate Tectonics has definitely paralyzed our thinking" and that proponents "have little factual data to support their observations and the resulting interpretations are thus misleading." He points out, for example, that not all mountain ranges conform to the current model. Of the Tibetan plateau he writes: "Plate tectonics see it as a doubly-thickened crust due to the collision but geophysical studies have shown that Tibet lacks any evidence of such a thickening and it is a single monolithic slab." He also argues that the Kunlun mountains to the north of the Tibetan plateau are too far removed from the supposed site of subduction of the Indian plate to make their presence plausible. Geological science is largely based on instrument readings, such as seismograms, while satellites play an increasing role in measuring movements and dimensions of the earth's surface. Scientists observe and study earth tremors in terms of the same natural laws that govern the spreading of ripples on the surface of a pond. Because vibrations travel at higher speed through solids than through liquids or gases, scientists can deduce how the inside of our globe might look. But just as we cannot travel to the limits of the universe, so it seems impossible for a living being to reach the core of our earth. Up to the present no one has been able to drill to a greater depth than about 10 km, which compared with the 6,300 km radius of the earth is less than puncturing the peel of a potato. 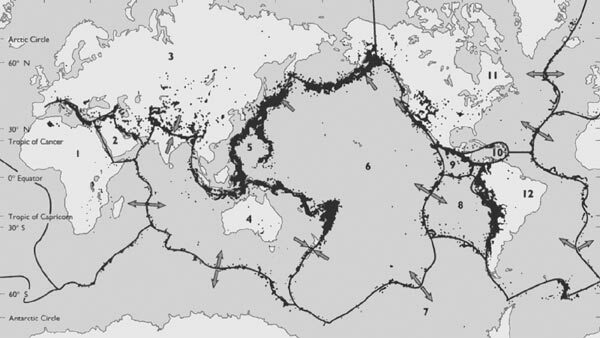 The generally accepted cause of earthquakes is the release of tension built up between floating continental plates. These large plates are propelled by convection or differences in temperature, warmer plates rising toward the surface while cooler ones dive toward the earth's interior. The process is further influenced by a spreading apart of the continents. Plate margins and earthquake frequency according to plate tectonics. "When the Wheel runs at the usual rate, its extremities (the poles) agree with its middle circle (equator), when it runs slower and tilts in every direction, there is a great disturbance on the face of the Earth. The waters flow toward the two ends, and new lands arise in the middle belt (equatorial lands), while those at the ends are subject to pralayas by submersion." G. de Purucker states that the rotation of our planet is caused by the entry of energies at its north pole: "for electricity, and magnetism perhaps especially, pursue a circuitous or serpentine path, somewhat like that of a spiral, and the entity through which it flows follows the circular impulse given to it and therefore whirls or rotates" (Fountain-Source of Occultism, p. 307). That the rotation of the earth is influenced by solar activity is demonstrated by the Danjon effect, discovered in 1959: sudden differences in the earth's rotational period which coincide with exceptionally intense solar activity, such as coronal mass ejections. Humanity, too, may play a role in geological phenomena. Agitation, atrocities, or any disharmony on a large scale could lead to a dispersal of astral and psychospiritual forces that nourish life. Just as cutting trees destroys the ecosystem of that forest and its soil is carried away by the rain, so human acts against nature on psychological and spiritual as well as physical levels may have serious repercussions geologically. Moreover, cataclysmic changes are said to be closely linked with human evolutionary development, even causing the bulk of humanity to perish at crucial cyclic periods.